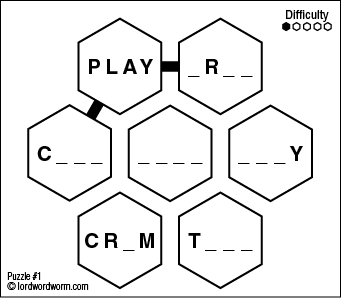 Lord Word Worm Puzzles are based on the classic concept of taking a word, changing a single letter to create a new word, then repeating this process to build a chain of words. 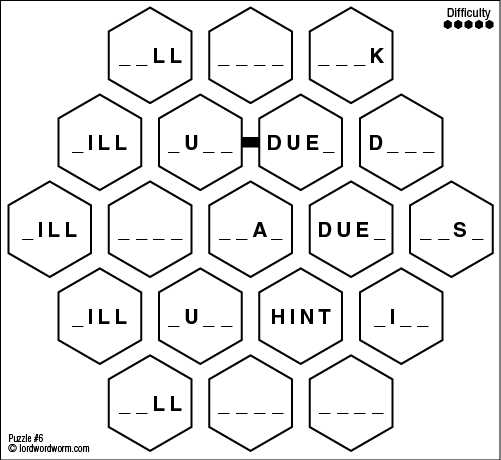 Lord Word Worm Puzzles consist of a series of hexes (hexagon shapes) containing four-letter words. 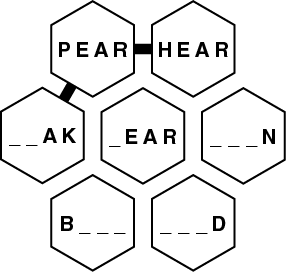 You must fill in the missing letters and join all the hexes together to form a single continuous "worm" of words. To create the worm, draw lines to join the hexes together so that every hex is joined to exactly two adjacent hexes. Puzzles will always have at least one join marked, to help you get started. 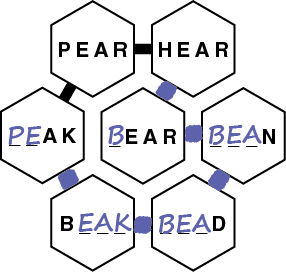 Each pair of joined words must have only one letter different - the remaining three letters must be the same, and in the same position (ie cannot be shuffled). Words cannot be repeated. Each Puzzle has only one possible solution. Words must be part of the everyday English language. Words cannot be slang, obsolete, contractions (such as "don't"), nor can they be proper nouns (names or capitalised words). Words that are primarily used to offend – and have no other valid use – are also not permitted. 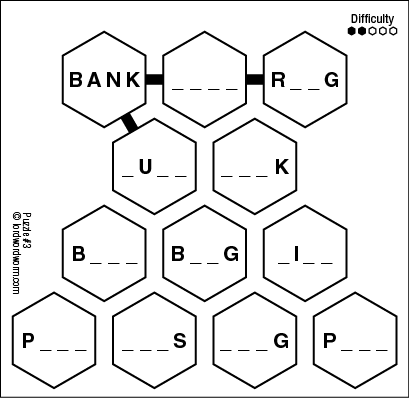 Download Puzzle or Solution as PDF. 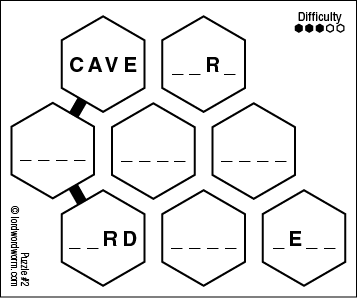 Our Expert level Puzzles (difficulty 5/5) require extensive logic and strategies, often taking several hours to solve. Before attempting them, we recommend players read the Tips page first and practice on easier puzzles to develop their skills. If you would like to play more Lord Word Worm Puzzles, please check your local newspapers and magazines. If they aren't yet printing our puzzles, please send us their details so we can get in touch with the newspaper or magazine to arrange inclusion of the puzzles. 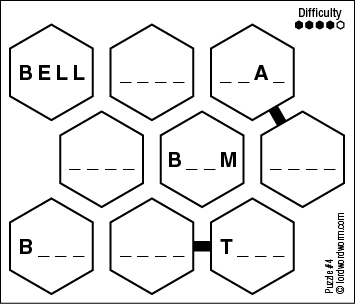 We are currently publishing a Lord Word Worm Puzzle Pad, containing 52 puzzles of assorted difficulties from Novice through to Expert. They should be available for sale in March. If you would like us to send you an email when they're ready, please send us your details at support@lordwordworm.com.